A ton has already been written about the power of social media as a marketing tool, especially in the event industry. Few other fields can make so extensive a use of social networks, and few other industries have as much to gain from doing social right. Chances are, this is already common knowledge for you – but while you understand the why of it, you might not yet be clear on the how. That’s what we’re here to talk about today. Running an effective social event starts with proper planning. It starts with a timeline, one which covers everything from initial preparation to post-event wrap-up. We’ll start with a few steps you’ll need to take care of before you start marketing. Choose Your Platforms: While Facebook and Twitter are sort of blanket platforms, other social networks cater to different audiences. Is your event targeted mostly at millennials? Instagram and Snapchat are where you want to be. Business professionals? Go for LinkedIn. Brand Yourself: How do you want attendees to see your organization? What sort of experience do you want them to have at your event? How do you want them to ‘feel’ when they see the event name pop up on their social feed? You need to answer these questions before moving any further – because your brand will influence every other aspect of your event. Assign Responsibilities: Choose who you want handling your social feed, from now until the day of the event. In order to keep your messaging consistent, the team should remain the same throughout. Decide On a Hashtag: Especially if you’re live-tweeting your event (you should be!) you need a hashtag that’s easily associated with your event. Make sure it’s simple, short and unique. But most importantly, make sure it reflects something about your event – for example, #HRTechConf (LRP’s Human Resources Tech Conference) or #TEDTalks (TED Talk Keynotes). Choose Your Apps and Tools: Your next step is to figure out how you’ll manage your social feeds before, during, and after your event, something that depends largely on the social networks you’re using. Will you be live-tweeting? Our own tool, Everwall, is a great choice. Create Social Templates: While it’s inadvisable to stick entirely to a formula when posting on social (it has the tendency to make your posts look a little too mechanical), creating a generalized template for your posts is a good idea, as it will help your social team promote things more efficiently. Plan for Technical Difficulties: What will you do if your hashtag gets hijacked? What happens if your chosen social network goes down during the event? Make sure you plan for these eventualities ahead of time. Now that you’ve taken care of your social media prep, let’s talk about how you can promote your event. Create Your Calendar: The first thing you should see to is a content calendar, an extended schedule that dictates when you’ll share content, and what content you’ll share at any given day or time. Ideally, you want to keep your posts to key hours when your target audience is online. Also note – while it’s important that you create a calendar and stick to it, there’s nothing wrong with a few extra shares here and there if you come across something really juicy. Make sure this calendar includes scheduled posts that will go out during the event as well. CoSchedule is great for this. Promote Your Hashtag: Every single post related to your event needs to have your hashtag attached – that should go without saying. You need to spread your hashtag around before the event, so your community has a foundation upon which to base their discussions. Remember also that hashtags are not strictly meant for promotion – they’re meant to foster discussion and help your audience find posts related to your event. Reach out to influencers: Know someone with a lot of clout on Twitter who’s interested in your event? See an Instagram model who’s bound to share a ton of pictures from the show floor? Talk to them! Invite them to attend your event, or offer them some exclusive content for their blog/feed. Stay Active and Conversational: Remember, social media is all about the conversation. Don’t just push out posts into the ether and expect a response – engage with people. Talk to your audience, start conversations with prospective attendees, and invite people to share their thoughts. Pay Attention to What People Are Saying: The web is awash in stories of brands losing control of their hashtag to trolls – and then proceeding to repost scores of troll posts through their automation software. While it’s important that you get people talking about your event, it’s important that you also keep track of what they’re saying. Gradually Ramp Up Event-Related Content: As you move closer to your event date, start including more curated content related to the event – blog posts, infographics, pictures, conversations, videos; anything that will get people more interested should start showing up with greater frequency (but be careful that you don’t spam people. Anything more than five posts a day is probably overdoing it). You’ve gotten people talking about your event – that’s great. Now that the big day has finally arrived, how can you keep them talking? Share Soundbites: Have a team on the ground at your event, taking pictures and keeping an eye out for quotable statements that can be attached to pictures and videos. Encourage Check-Ins: Plenty of social networks now give people the opportunity to share their location when they make a new post. Give them the opportunity to, either through RFID/Bluetooth tags on the floor or through an event-related app. Set Up Signposts: Use a tool such as Tweetwall to automatically display event-related posts from the floor – the opportunity to appear up there for all to see will encourage a lot of participation. Make sure you curate it properly, though. Drive Conversation: In addition to encouraging people to post and share from the floor on their own, your team should be actively conversing with people while the event is going on – did someone retweet a great joke? Let them know. Did they share an awesome snap? Give them a call out! 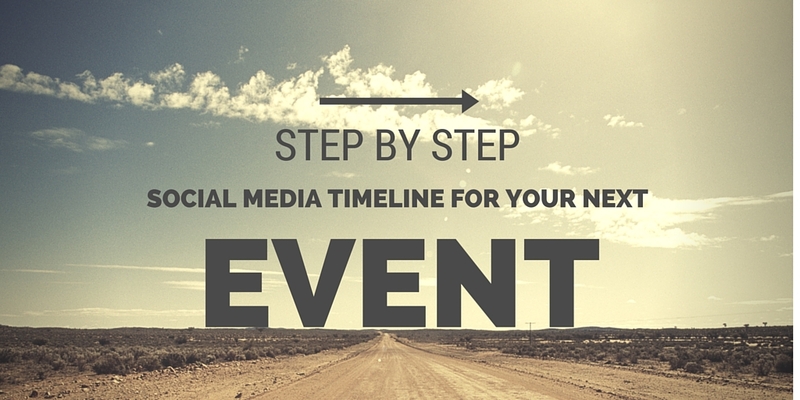 Your event may be over, but your social media timeline definitely isn’t. Here are a few things you should do once things start to wind down. Ask For Feedback: You’d be surprised how much of a response you can get from a simple concluding post. Something like “And that’s it for #Eventhashtag2018. Stay tuned next year – but in the meantime, how’d you enjoy it?” can generate a bunch of conversation once the show floor’s emptied out. Write Up Some Retrospectives: Retrospective blog posts going over some of the key speakers/guests and their contributions can generate a lot of buzz on their own. Publish Slides, Videos, and Keynotes: Embed content from keynotes into your posts through a medium like slideshare or YouTube. This will allow people who didn’t attend to experience your event, and give attendees the opportunity to share their experience with others. Round-up The Best Third-Party Content: Look through the posts people shared during your event, and add some of the best ones to your Facebook Page, Twitter feed, or Instagram – being sure to give credit to the original authors, of course. Give Thanks: Self-explanatory. Thank people for attending, summarize some key points about your event, and let them know if/when any additional content (for instance, a published FAQ) will be available. Keep Talking Until The Hashtag Dies: Again, this is pretty self-explanatory. Follow conversations about your event on social, and continue adding contributions of your own until there’s no more conversation to be had. Start Looking Towards The Next Event: Look back over everything that transpired, and ask your team what you did well, and what you might do better. Start right away on building a plan that’ll make your next timeline even better. Which Social Platform Best Suits Your Brand’s Goals?